Here come my latest three Canadian Militiamen (see the masters here), just painted and ready for battle. Disciplined, frugal, and well trained in forest warfare, Canadian Militiamen proved to be an invaluable asset in the defense of New France. On campaign, their dress was hardly distinguishable from that of their native companions. In the Summer, a white or pale brown linen shirt was worn, as well as breechclout, leggings, and moccasins. In colder weather, a hooded capote, or cloak, was often worn, sometimes shortened and reaching to just about mid-thigh, closed in front by a woolen waist sash. Popular headgear included knitted woolen stocking caps, or tuques, and military-style forage caps, or pakalems. Weapons included a musket, most likely a Fusil de Chasse (here) but possibly a military musket of the type issued to colonial regulars (Tulle Fusil ordinaire, here), axe, and butcher knife. Powder horn or flask, ammunition pouch, belt pocket and gourd water canteen completed the typical kit of a militiaman. 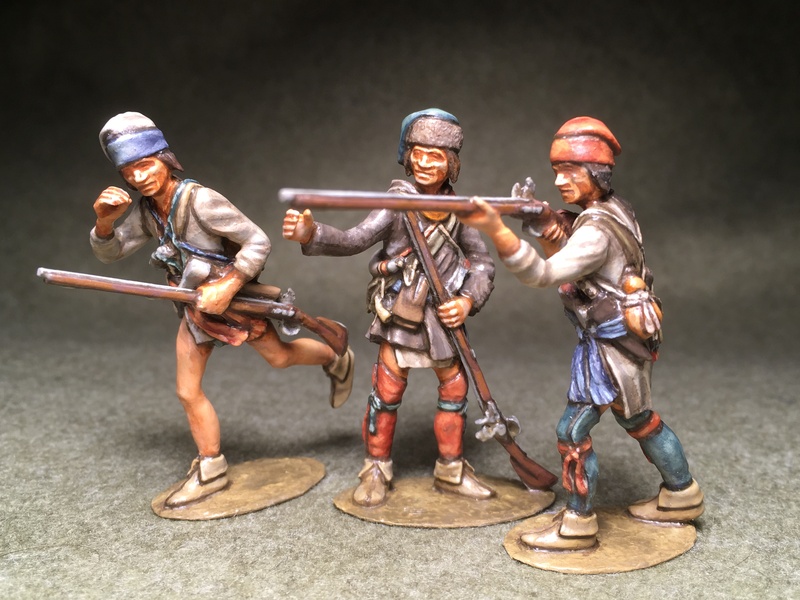 Militiamen figures may as well serve as Coureurs-des-Bois, literally “backwoods runners”, the adventurous french-canadian hunters, fur traders, and smugglers.